Fritz Reuter (1810-1874), a remarkable German novelist and political martyr, is portrayed on a grand scale through this 9-foot tall bronze monument. Reuter was imprisoned for seven years by the Prussian government for participation in a student political activism club, yet he continued writing and conjuring characters in good humor. 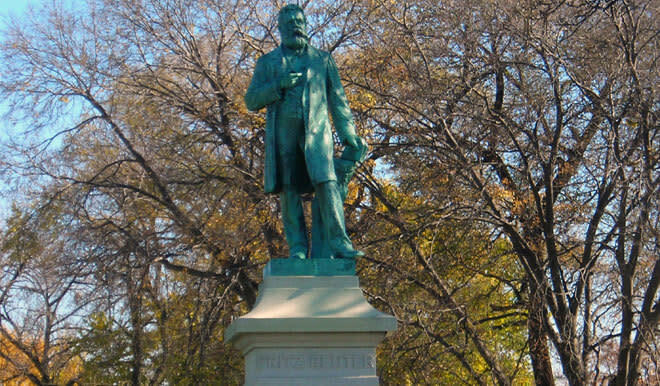 He was admired by the German Americans of Chicago who honored him by commissioning this sculpture. The German- American sculptor Franz Engelsman (b. 1859) was selected to sculpt the piece after he won an 1887 competition. The West Park Commissioners installed and dedicated the monument in 1893.